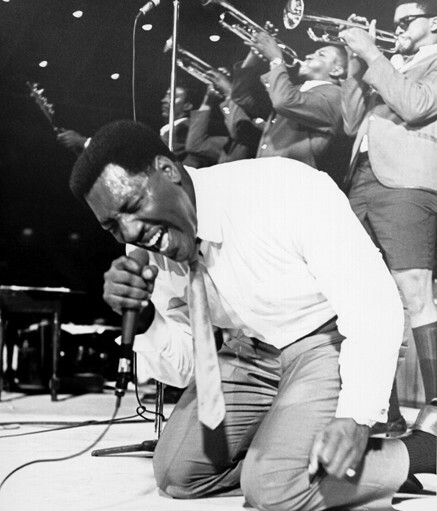 - "I've Got Dreams to Remember"
- "That's How Strong My Love Is"
- "Sittin' On The Dock Of The Bay"
- "Try A Little Tenderness"
- "Your One And Only Man"
And once you're done listening to those, you're encouraged to shake it like a bowl of soup. • This is why I need an agent. • It takes some real skill to write an article for MLB.com that would more easily fit in The Onion. • Adele is the Donovan McNabb of female British soul singers. • I've always avoided marrying Hank Aaron for specifically this reason. Lauren Lauren! • Gus Johnson finally gets a much-deserved bigger stage by going from CBS to FOX and one of his broadcast partners for NFL games is Tim Brewster. • One question was missing from this interview: "Why does Aaron Gleeman sound like you?" • As a Minnesotan I'm firmly on the "pop" side of the heated pop-versus-soda debate, but we can hopefully all agree to make fun of the people who call it "coke" regardless of the brand. • If you're going to sit directly behind Brooklyn Decker at an Andy Roddick tennis match, this is basically the perfect shirt to wear. • As a rookie Jerome Williams was too scared to correct any Giants coaches or players when they called him by the wrong name, so they thought he was "Jeremy" for two years. Seriously. 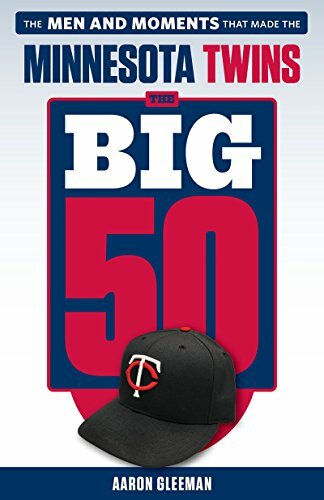 • I'm going to be on 1500-ESPN before the Twins-Tigers game Saturday afternoon, talking with Darren Wolfson from 1:30 to 2:30. Tune in, listen online, and/or give us a call. Words to live by, especially if you're really into having fights with strangers. • Louis C.K. 's great tribute to George Carlin was equal parts hilarious and touching. • It's good to see that Elisha Cuthbert has finally recovered from being stripped of the Official Fantasy Girl of AG.com title in 2006. • I hated Jonathan Taylor Thomas because every girl in my elementary school loved him. And now I hate him because his 30th birthday makes me feel very old. Other than that, we're cool. • Alex Rodriguez is so cheap that he spent less than one year's salary on his new house. • Brock Lesnar's first fight in 14 months will be one of the biggest in UFC history. • My cooking show again wasn't mentioned, but everything else sounds good to me. • In back-to-back games the Twins' official lineup card--which is typed out and signed by Ron Gardenhire--listed Brian Dinkelman as "Dinkleman" and Liam Hendriks as "Hendricks." • Stephen Strasburg returned to the big leagues 12 months and three days after Tommy John elbow surgery and averaged 96.7 miles per hour with his fastball. • I finally watched Source Code. It was a B-minus execution of an A-plus concept, but still pretty enjoyable. Seems like it kinda flew under the radar, but definitely worth renting. • On a related note, there won't be a problem as long as he stays away from Aubrey Plaza. • Fantasy football continues to take over the world. 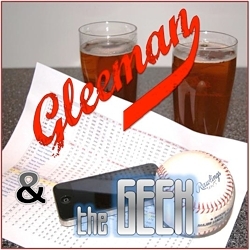 • Thanks to Kirsten Brown of K-Bro's Baseball Blog for the new "Gleeman and The Geek" logo. • And if you haven't listened to this week's podcast yet, click here. It was a fun/weird one. • My latest weight-loss effort reached the sixth-month mark Wednesday and I'm very happy to report that I'm down 102 pounds. That sounds impressive and it was definitely hard work, but without question the biggest key to losing 102 pounds in six months is being really, really fat to begin with. I also still have lots more work to do, so anyone who sees me can't be blamed for thinking: "Wait, he still looks like this after losing 102 pounds?!" Because of all that I'm always sort of embarrassed to talk about losing weight, but hopefully it serves as motivation for me to keep going and maybe even for other people to make a change as well. Certainly if I can do it, you can do it. I didn't have any surgeries or go on any extreme diets, so simply cutting way back on calorie intake and working out on an elliptical machine for a half-hour or so each day can have a significant impact. Now we'll see if I can avoid relapsing. ‘These Arms of Mine’ was the first song that got me hooked. I can’t say he is my all time favorite, but top 10-15 for sure and I’d agree with everything you said about his untimely death. If Aaron or any others ever get the chance to go to Memphis, make sure to go to the Stax Museum. It’s my favorite stop in Memphis right up there with the National Civil Rights Musuem, which is incredible. It’s the record label where Otis made his mark and its basically in the middle of what is now a rough neighborhood, but it is where Otis, Isaac Hayes, Booker T and the M’s, Aretha Franklin and many others grew up. In other words a few neighborhood blocks of amazing talent. The years Otis was there he was everyones favorite person and he was the leader of their little renaissance in time, amazing. I was really impressed with Source Code, concept and execution. Between Moon and Source Code, Duncan Jones’s agenda appears to be to use existential themes and create something uplifting. That’s always welcome in my book. I like how Jones told such an engaging story and the movie cost relatively next to nothing to make other than paying Jake Gyllenhaal. It cost $32 million, put up a 91% rating on Rotten Tomatoes, and grossed $132mm worldwide. Is Duncan Jones the Andrew Friedman of sci-fi/suspense right now? 102 pounds? That’s an amazing achievement, Aaron. Congrats. Congratulations on the weight loss Aaron – regardless of what weight you started out at, 102 lbs in 6 months is A LOT and is an impressive amount of weightloss. Eat less and exercise? What kind of a gimmick diet is that? Seriously though, dropping 100 pounds is pretty impressive wherever you started from. Congrats on the weight loss Aaron. Really impressed. Given the weight loss, is it time for a more flattering billboard photograph of the new AG? On your Twins top 40 for 2011 – do you think with Matt Hauser contributing to the Snappers (best era) Miracle (one of the best era’s) & Rock Cats 4 K’s 0 walks in 3 innings – maybe he will crack to top 40 for 2012? would think the top 25 for sure. Aaron congrats on the weight loss – I agree a new picture is in order. Re: Adele…one of the best actors I’ve ever worked with regularly pukes between acts of shows because he’s so nervous. He’s hugely talented and he’s been doing it for a couple of decades, but he still has gripping fear every single night. That Jeter article reminds me of the description of ninjas at http://www.realultimatepower.net/index4.htm.